Megan and the gang (mums and daughters) from Hazel Faye Boutique recently commissioned some custom vinyl lettering to adorn their shop. 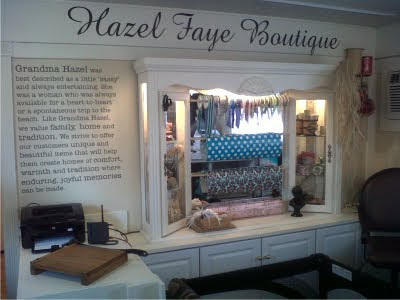 We created the boutique name of course, and then a lovely little note about the boutique's inspiration - Megan's grandma, Hazel Faye. Apparently Grandma Hazel was quite the character (and made me think of my own spunky grandmother). She "was best described as a little 'sassy' and always entertaining." Fun, right? And what a great inspiration for a great little boutique. And isn't their shop so neat? I love that their aim is to provide their customers with "unique and beautiful items that will help them create homes of comfort, warmth and tradition where enduring, joyful memories can be made" because really, that's what we're about too. I wish I could be there to browse around and pick out a treasure or two to take home. Thanks for letting us help, girls. And for introducing us to Hazel Faye. Best of luck!